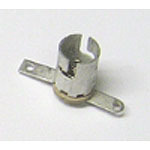 2-lug lamp socket for bayonet style bulbs (#44, #47, etc). Allows entire glass section of lamps to protrude up through top of playfield or through insert panel in backbox. Commonly attached to wood surface with staples. Used in older vintage games all the way up through later-model games. Replaces Bally # E-120-176, Chicago Coin # 5232, Data East / Sega / Stern # 077-5000-00, Williams # A-8262, and similar others.